Now on to the new year. What are your goals for this year? How has your last year been? I see quite a few familiar faces still holding some impressive streaks. Anyway, how's it going? It's been good submitting to the streak for the last year, it's nice to have something I'm committed to work on consistently. I had aimed to make it a full year which I've passed, onwards to 2 years now. I have some vague art goals to work on, but mostly it's just keep at it. I can see some areas in my art I've improved with over the year, but a bigger benefit I think has been becoming much more comfortable and confident to just pick up a pen and draw. Less often I have to force myself to draw and more often I'm pretty happy with the result. My own personal goal for 2018 regarding art is just that I want to keep doing it. Right now having a phase where I'm programming so much that I'm not really in the mood to do some art, but I'm sure that will change again soon. Art has become such a wonderful part of my life that I don't really know how I spent my life before. I really love the new discussion feature that pops up when you add a piece to favorites! All these new updates have been great and help to make commenting and the like friction free! My personal goal for 2018 is to overcome my issues with construction, increase my expertise in figure anatomy and eventually integrate 3D modeling into my daily work. I want to eventually get back to making pixel art, improving as an animator and feeling confident enough to illustrate the things that come to mind as a professional. Is it possible to change the order of uploaded files now? If not, I miss that feature and would like to see it back! Is it possible to change the order of uploaded files now? I only discovered the site 12 days ago when @talecrafter posted a link to it on twitter. My goal for 2018 is to get better at composition and to draw environments and situations instead of cartoony characters with big heads in the same 2-3 static poses over and over again. I also hope to improve my line work, because I have a tendency to go fast and sloppy. I will be switching between traditional pen and paper, digital painting and retro pixel art. Thank you for hosting this, I also discovered it when Stephan posted the link on twitter. I don't have any formal arts education (well, other than art history, which actually has been super helpful) so I need to keep on track with lots of practice and this helps. My primary goal for 2018 is to incorporate and get more comfortable working with & animating human & animal figures. I love doing backgrounds but I've noticed actually including figures in a scene can make it way more dynamic and it tends to get more interest from people looking at it. My secondary goal is to put together a simple adventure game. There are a couple really good free adventure game engines out there, and I feel like a huge chunk of the stuff I've been doing could be mistaken for a mid-90s DOS CDROM title. One question I haven't been able to figure out so far, how the heck do I format my twitter address so it actually shows up in my profile? Still doesn't seem to be working for me. Oh well, not a huge deal. Your backgrounds remind me of scenes from Another World or The Dig, definitely be good for that sort of game. I get the Another World comparison a lot, and consider it a big compliment, but of course the Dig is also one of my favorites (and one of the unsung classics), so thanks! Honestly I've tried before and while I was a lot less talented at the artwork the hardest part to making an adventure game is all the writing you need to do, and I'm honestly not much of a writer. Ok well that and sound/music. That takes an entirely different skillset and equipment I just don't have access to. Hey, thanks for the email remainder! I had forgotten about this site, I’m glad it’s still alive! It’s nice to see familiar faces and so many new people. Thanks for your work on the site leafo! I just did a quick check and I don't see any broken images. Nothing will ever get deleted but the service that resizes images might start acting up. Tell me if you're still seeing it and on which page. I see it anytime I scroll down a bunch??? Instead of images it shows little white boxes. 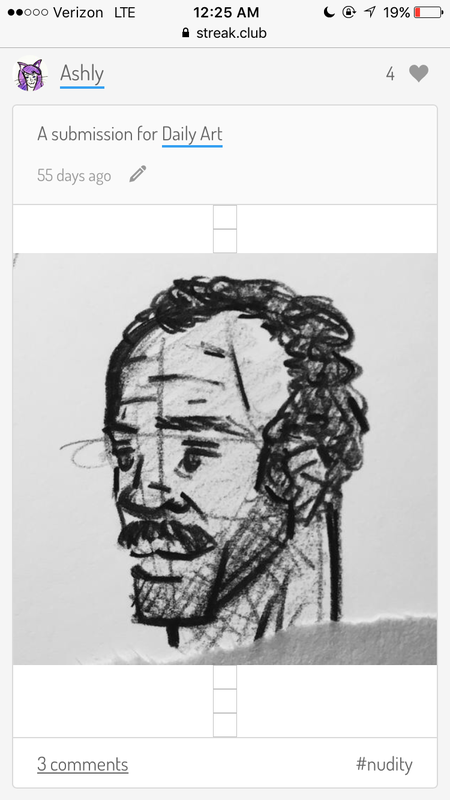 I went scrolling through my page a while back looking to save some drawings and after it has to load more posts, they start popping up and keep popping up. Here's an example from a few minutes ago, scrolling down my profile. Edit: It doesn't seem to happen when you scroll down the front page of Daily Art, just like...an individual's page. I was talking with Penbee about this, and it seems that images posted in hidden streaks get indexed and are public. I dont think this is the intended behavior, and if it is it shouldn't be! Is it possible to make it so that hidden streaks and their content don't get outed on search engines! I'll take a look into this. Do you know which pages search engines are picking them up from? It seems to be any hidden streak, specifically my NSFW art streak Escape Claus and Penbee's NSFW art streak #inkjelly from what I can tell? I forgot I never got back to you, but this issue should be fixed now. Tell me if you are still spotting it. Log in to replyLog in to your streak.club account to participate.